I remember being ten years old and seeing the ads for glow-in-the-dark toys and stickers in the back of comic books. That seemed like the coolest thing ever! When I started making money of my own, I wasted no time in buying glow-in-the-dark dinosaur stickers (their skeletons glowed) and I even collected glowing toys for a while. So when I learned there was glow-in-the-dark polymer clay I was ecstatic. I made a few things, but wasn’t too thrilled with the poor glow duration. Well, times have changed and we now have access to so many cool craft materials. Now you can make DIY glow-in-the-dark polymer clay. Read on to learn more. First, though, let’s get a little background information about what glow-in-the-dark polymer clay brands are on the market. Cernit Glow-in-the-Dark – As part of Cernit’s Translucents line, there is a glow-in-the-dark polymer clay. It is the typical creamy greenish-yellow color and it does have a strong glow. But sadly, the glow diminishes almost immediately after turning out the lights. Fimo Night Glow – Fimo’s glow-in-the-dark polymer clay is part of their Effect line of special effects clay. It’s a fairly opaque translucent and so the clay appears creamy with a slight yellow-green tinge. The glow is strong, however, but not as strong as that of Cernit. It also fades very quickly. Pardo Jewellery Clay – Not part of the famous Pardo Translucent Art Clay line, the glow-in-the-dark clay from Viva Decor is part of their gemstone-themed Jewellery Clay line. I’ve not used it, so I can’t comment on its usability or glow. Pluffy Glow-in-the-Dark – Part of the child’s fluffy polymer brand, Pluffy, the Polyform website does list glow-in-the-dark as part of this brand’s color line, but I can’t find more information than that. Commercially available brands of glow-in-the-dark polymer clay. Left to right there is Sculpey III (orange, blue, green, and cream), Fimo Night Glow, and Cernit Glow-in-the-Dark. These are baked. We’ve all seen it, but what is it? I mean really? Glow-in-the-dark (GITD) items are made with a phosphorescent pigment that is mixed into paint or incorporated into the item itself. GITD pigment contains chemicals that absorb light energy and then slowly emit it back out over time, even after the source of light is gone. Therefore it will glow in the dark. This is different from bioluminescence (such as fireflies), chemiluminescence (such as glow-sticks), and fluorescence (day-glow paint). By the way, similar to the phosphoresecence of glow-in-the-dark is another quality of light that we encounter in polymer clay called fluorescence. Some colors/brands of polymer clay have added fluorescent dyes that make the colors appear more bright. 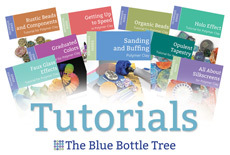 Learn more in my article about Optical Brighteners in Polymer Clay. You can use these fluorescent qualities in your polymer clay designs, too. Learn more and see examples in my article about UV Reactive Designs in Polymer Clay. Okay, back to glow-in-the-dark polymer clay. Phosphorescent pigments can be used much in the same way as any other pigment. You can mix them with paint, resin, mix them into plastic, and even into polymer clay. Because the pigment particles absorb and emit light, they won’t work well when mixed into colored or pigmented media. This is why GITD items are typically made with clear media where you can see the pigment particles themselves. Adding color to a glow-in-the-dark material will inhibit the amount of glow. Sculpey Glow-in-the-Dark kit colors. The orange and blue colors glow far less because the color of the clay blocks the light. There are two main types of glow-in-the-dark pigments. Zinc sulfide is an older variety and doesn’t have a very bright glow, fades in 30 minutes or less, and generally only comes in one color. Newer strontium aluminate is much brighter and emits light for much longer (up to 16 hours), and are made in several colors. Nowadays, you’ll find that commercial applications of glow pigments will use the brighter pigments. The older zinc sulfide is used in children’s toys. Judging by the rapid fade of the glow in commercially available glow-in-the-dark polymer clay, I’m guessing that they use the older zinc sulfide pigment. Glow-in-the-dark pigments are not radioactive, don’t contain lead, won’t wear out with time, can’t be over-charged, and are exceedingly heat stable. Wait…heat stable? Yes, that means you can add them to polymer clay without any problems! Ben from a company called Vadien sent me samples of four varieties of high-intensity glow-in-the-dark pigments to try with polymer clay. He sent me samples of green, aqua, blue, purple, and granular green pigments. The first four are fine dust, but the granular green pigments are larger particles, similar to coffee grounds, that have a very intense effect. You can find Vadien’s pigments on ebay here. You can get the correct glow powders on Amazon here, but don’t choose the fluorescent ones here…they’re not as good. Another source of glow powders is Poly Clay Play, so if you also need to get some other clay supplies, you can save on shipping. This is a thin circle of Pardo (L) and Premo (R) polymer clay mixed with granular green glow-in-the-dark powder from Vadien. Looks like the night sky, doesn’t it? Remember how I said that commercially available clay brands didn’t glow for very long after the lights went out? So what does that look like? And how long will these modern glow powders actually glow? I tried to photograph it, but as it turns out, our eyes are far more sensitive than the camera. So what looks dark here is still quite bright to my eyes. As you’ll see in the GIF image below, the commercially clay brands (top row) glow brightly with the first frame, but within five seconds they fade noticeably. They were pretty much done within five minutes. The DIY glow clay (bottom two rows) also fades quickly at first, but then it levels off and you can still see it for hours and hours. I came back in the middle of the night and could still see bright dots around the studio. The dark circles on the bottom two rows are the purple glow powder. It IS visible to the naked eye, but it’s much dimmer than the other colors and the camera couldn’t capture it. Also note that DIY glow-in-the-dark polymer clay using glow powders does glow more brightly when using Pardo (middle row) than using Premo (bottom row) as a base clay. Click to see the GIF move! This GIF shows how much faster the top row (clay brands) fades than the ones on the bottom two rows (DIY glow-in-the-dark polymer clay). You can see this same pic labelled in the daylight picture further up the page. I used Pardo Translucent Art Clay as it’s the most clear brand of polymer clay. I also used Premo White Translucent as it’s the most readily available. You do need to use translucent clay. Work on a glass or ceramic tile. Condition your clay and roll it out in a thin sheet (5-6 on the pasta machine). Spread a very thin layer of liquid Kato Polyclay or Sculpey Clay Softener. I do this because the powdered pigment is very drying (like adding too much flour to cookie dough), and the liquid clay helps make it mix easier. Roll it up like a jellyroll and start mushing it around until it’s mixed enough that no powder falls out. Continue mixing with the pasta machine or your hands until it’s fully mixed in. I found that mixing the powder into the clay was quite drying on my hands and it did sting on a cut, so you might prefer to wear gloves. (Though I never saw anything about GITD powder being toxic.) I found that the purple glow pigment was very faint and while it did glow, the others were so much brighter. I even added twice the amount of powder, and it still was pretty faint compared to the others. Boring and delicate by day, but exciting and stunning by night, this polymer clay “Sea Plant” looks like it came from the deep trenches of the ocean. So, what can you do with your DIY glow-in-the-dark-polymer clay? The sky’s the limit! Because the clay itself, in normal light, is the usual translucent-clay color, you can use it anywhere you’d use translucent clay. Try using it to add glowing accents to your jewelry. But be careful if you wear this jewelry to a movie…it will be seen! Add glowing numbers to a clock. Create hidden images. You could even make a signature cane that looks clear but can only be seen in the dark! I made the petals of this “Sea Plant” by doing a flame cane using a green-to-translucent blend and a blue-to-translucent blend. I used aqua glow powder to make the stems. There’s also a spot of aqua on the outer edge of the leaf. By the way, I used Teresa Salgado’s Canebenders to help shape the cane. I made the whole thing with Pardo Translucent Art Clay and the thin stems have wire inside that I can shape to rearrange the leaves! Looking for some inspiration to get started? 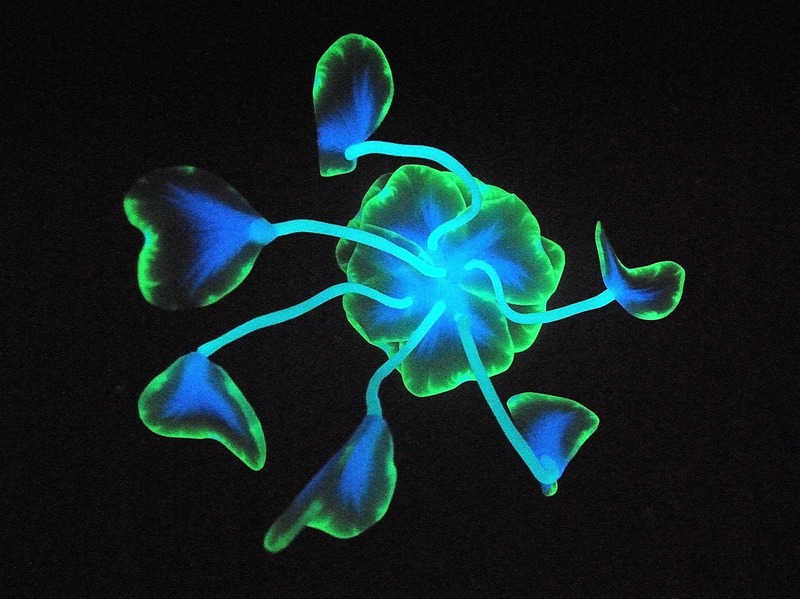 Try doing a google search for “bioluminescent organisms” that naturally have glowing properties. Here’s a really neat graphic with lots of ideas, too. (Thanks to Carol Foster-Hall for that link…it’s great!) And don’t limit yourself to thinking of natural forms. You can use glow-in-the-dark polymer clay in all aspects of a composition to reveal things that are only there once the lights go out. This really neat video uses paint with these pigments, but see how many ideas you can get from it! Thank you for this article. I am also a fan of glow in the dark and it has never lost it’s charm for me. I’ve been working on some sea creatures for a while and was frustrated by my inability to change the colors of the glow and by the short glow time. Immediately ordered a sample vial of each of the colors and I can hardly wait to start playing again. Now that I have a variety of colors, my creative juices are flowing again. where do you get the glow in the dark powder? this is so cool!!! would the pigments work with pouring medium? There’s a link in the article to the source I got them from. But you can also find them on Etsy and eBay. And yes it should work beautifully in pouring medium. I got my powder from Vadien, that’s linked in the article. But you can find it on many websites, just do a search. I have to say that I love love LOVE your site! I am relatively new to polymer clay and I’ve learned quite a bit reading your articles. I’m getting into glow-in-the-dark clay as I’d like to learn to create artwork even when the lights are out. Thank you for all the hard work you do to help people make the best decision on all thing related to clay!!! This is just awesome!! There’s nothing polymer clay can’t do! I actually really like the granular pigments effect, reminds me of glow in the dark sea plankton. I’m thinking this clay would make great “night buddies” for kids (and adults!) to keep by their beds. That link with glow in the dark creatures is really very cool, so many ideas! I think my head might explode! I see that the store has small quantities of pigments available in vials, but it’d be nice to have a variety pack or trial pack with all the colors together in one set. Not that this is going to stop me from getting them! Question: could the finer pigments make their way through a silkscreen? I have a circuit board silkscreen and I was thinking how cool it’d be to have the pattern glow in the dark. I’m thinking they’d work well with resin as well. That is WAY too cool Ginger! I have some UV powders that change color in UV light that I have played around with a little with awhile back, but I wasn’t getting the results I wanted.Your article has inspired me to get those out and do some more experimenting! Love your sea plants! I think I will make some Fairy Garden elements… maybe some little mushrooms and things? Or maybe lanterns and windows and such. Years ago I did a glow in the dark jellyroll cane tutorial where I colored Premo Glow in The Dark clay with alcohol inks. I am thinking a combination of inks and these powders could create some spectacular results! I did some experiments a few years ago with tinting the Sculpey GITD clays with alcohol inks. That’s actually what I used to make the flowers in the switchplate pictured in the article. The alcohol ink blocked the light and those colors didn’t glow very brightly. It really surprised me, but I guess it makes sense. I think you could lightly tint them, however. Just to get some neat variation. I was also thinking about using alcohol ink to paint the surface. Again…very lightly. So many possibilities with this stuff, really! Like you I love the glow in the dark clays 🙂 and was excited when I found them, I have used them in many projects but found that if I mixed the different brands of clay together I was able to get the strength needed from the clay, but was never happy with how long the glow lasted. I love this! So fun and so cool! Thanks for sharing your findings with us. 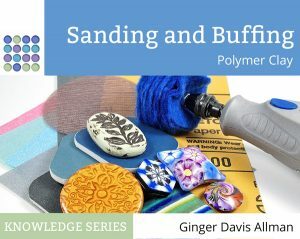 Ginger, have you tried any of the GITD powders in translucent liquid clay? I am sure that it would work in the same way as it does mixed into the solid clay, but it could be interesting to “paint” a clay/powder mix in a ragged manner along an edge, or silkscreen or stamp it onto a surface! Also, do you know if resin has any effect on the powder, either as an “over the top” coating or with the powder mixed into the resin as an inclusion? It could make very interesting galaxy look jewelry. SOO many things to try, SOOO much cool stuff to buy to play with! Sooooo little time and money. Sigh. I don’t see why it won’t work in liquid clay with the exception of sometimes liquid clay can get all bubbly when you add things to it. It’s supposed to work great in resin, too, but I’ve not tried it. Yes, it would be excellent for galaxies. One of my upcoming tutorials in Polymer Café magazine uses glow-in-the-dark Sculpey clay. It’s a cool effect, but the fact that it only lasts a few minutes is disappointing. Do you mind if I mention this blog post in the tutorial and point folks to ways they can get a longer glow? Absolutely, Sandy, go right ahead. Thank you! Thanks for a detailed and helpful article! I ordered some pigments from Vadien’s Etsy shop and can’t wait to try them! Wow! So amazing I love using glow powder. I do have a question about the wire though I’ve never been happy using wire in my clay for structure (it’s difficult to do) and would love to know what wire you used here. Thank you! I just used some 24 gauge Artistic Wire. Nothing special. It doesn’t hold quite as well as I would like, but it does give a wee bit of structure and helps the stems to hold their shape. Do make sure to use a flexible clay. Here I used Pardo, but I’m not so sure that Premo would be quite so forgiving. Cernit would be another good option, as would Souffle. Hello! My name is Bill and I do a lot of murrini caning. This article is awesome!!! I played with some GID pigments when I wanted more color variety of glow colors. I used FIMO translucent to mix my pigments as the FIMO translucent is UV reactive already on its own. Mixing the pigments seems to make them “pop” more under a black light (UV light) and glow a bit brighter. I prefer Kato for my caning but I’ve been using the FIMO pigment mix with the Kato with no issues. Hi Bill/Boro! I have seen your work with GITD as well…very nice! Yes, the Fimo trans is UV reactive and so is Pardo. Kato isn’t. Isn’t it great that we have so many materials to play with? I love that you are pushing the boundaries. By the way, have you seen my article on UV reactive clays? Thanks Ginger! I bought some pigment from Vadien and worked with it using Pardo Art translucent clay. I made a glow in the dark disc to affix to the on/off touch control of a bedside lamp. I cut out some little stars with the extra. ⭐️⭐️ Thanks for the link and great article. Excellent! It’s so much fun. Glad you’re enjoying the idea. Another well-written article, thank you for all your research. Thanks so much for the research! Here are some of the tiny lanterns I made. I made my own GITD clay using the Smooth-on product Glow Worm Green. The proportions of powder to clay are about the same as the product you used. Fantastic! I just shared these on my Facebook page. I wanted everyone to see them! Many thanks again for all the research, articles and information you share, I am much indebted to you. Thank you Claire. I’m so glad that my article helped you “save the day”. And yes, the glow powders are so much brighter! That’s fascinating! Thanks for sharing!